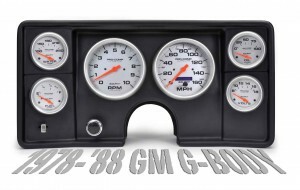 Carson City, NV: Classic Dash has announced a new molded ABS composite dash panel in three finishes for GM G-body cars, rear-wheel drive iterations that were produced from late '78 until early 1988. These cars include the Buick Regal/Grand National/GNX, Chevrolet Monte Carlo, El Camino, Malibu, GMC Caballero, Oldsmobile Cutlass, Pontiac Gran Prix and Grand Le Mans and Bonneville. In keeping with all the company's previous offerings, the G-Body panel is clean and stylish. Lightweight and exceedingly rigid ABS plastic sheets are vacuum-formed at 320 degrees Fahrenheit and the material is impregnated with a UV inhibiter that protects it from sun damage. Accuracy is the key. A Thermwood 5-axis CNC high-speed router consistently trims the dash panels to within 0.005-inch. 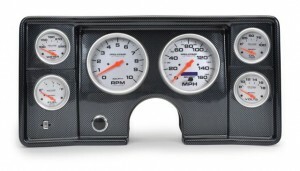 The Classic Dash panel is available in carbon fiber, brushed aluminum, or black finishes. All panels are offered in two forms: with or without gauge openings, and with or without gauges. 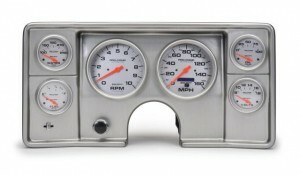 Gauge selection includes several variations from Auto Meter and Classic Instruments. Auto Meter kits include wiring harness from gauges to factory loom, LED turn signal indicators, and high-beam and emergency brake light indicators.